HANNOVER MESSE 2015 is a huge Trade Show that was ceremoniously opened by the German Chancellor Angela Merkel, together with India’s Prime Minister Narendra Modi. 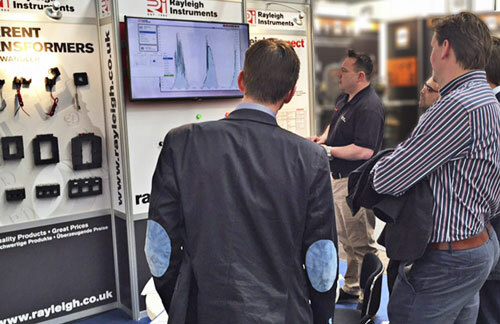 Among the products displayed by Rayleigh Instruments at the show was our Cloud Based Software 'Rayleigh Connect' and our Patented 'EasyWire' Metering System, both of which generated tremendous interest. Rayleigh Connect is a cloud based energy management and remote control software package. Users can access the software online from any terminal (PC, Ipad or smart phone) that has connection to the internet, or offline if required. Applications are also available for IPhone, IPad and Android devices.When used as an energy management metering solution it allows the user to record data from one up to 4096 electricity, gas, water, heat meters or temperature sensor. Any device with pulse outputs or RS485 modbus can be connected via an interface module, such as 'Easy Control' GSM device (1-16 meters), 'Easy Control Expert GSM Device (1-128 meters), 'Easy Ethernet Device (1-510 meters) or other approved units. These devices then transmit the collected data to the software , at a selectable frequency from once per minute up to once per month. Pictured above - Rayleigh Instruments Ryan Welshman demonstrates the user friendly interface of the rayleighconnect system and shows a graph illustrating the drop in output from a solar energy site during the recent solar eclipse. UK and EU Patent Approved - more countries to come. These savings are made possible due to the innovative design of both the current transformers and the meters, which allow plug in connectors to be used for both current and voltage input/output. An RJ45 lead is used for connecting between the three phase current transformer and meter, and 'readymade' plug in leads are used for the voltage input. The meters are provided with both input and output voltage connections which allows multiple meters to be powered from one supply. Connect your current transformer Plug one end of the RJ45 lead into the multifunction power meter and the other end into the three-phase current transformer and you’re done - it’s that simple. More than one meter?... Plug the ready-made ‘linking’ lead connector from your first meter to your secondThis system is safer than using traditional current transformers because Easywire transformers incorporate the resistive shunts usually located within the power meter. This means that the secondaries are always loaded, therefore eliminating the possibility of dangerously high voltages developing during open circuit conditions. This allows the meter to current transformer to be disconnected without the need for secondary shorting terminals, again saving money and reducing downtime. Rayleigh Instruments were proud to have exhibited at this fantastic show, and will look be be present again in 2016 - Thank you to all those who attended - see you next year!